On Wednesday, May 13th, at 7pm, author DW Gibson will launch his latest book, The Edge Becomes the Center at Book Culture on Columbus. DW Gibson is the author of Not Working: People Talk About Losing a Job and Finding Their Way in Today's Changing Economy. His work has appeared in publications such as The New York Times, The New York Observer, The Daily Beast, BOMB, and The Caravan. Gibson serves as director of Writers Omi at Ledig House in Ghent, New York, which is part of the Omi International Arts Center. If you live in a city, you've seen firsthand how gentrification has transformed our surroundings. It has so altered the way cities look, feel, cost, and even smell to such an extent that it's hard to imagine that it could ever have been otherwise. The Edge Becomes The Center captures the stories of the many kinds of people brokers, buyers, sellers, renters, landlords, artists, contractors, politicians and everyone in between who are being shaped by and are shaping the new New York City. In this extraordinary oral history, DW Gibson takes gentrification out of the op-ed columns and the textbooks and brings it to life. 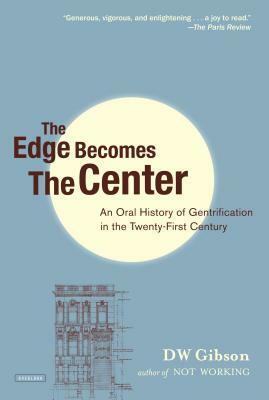 In the plainspoken, casually authoritative tradition of Jane Jacobs and Studs Terkel, The Edge Becomes The Center is an inviting and essential portrait of the way we live now. How did you come to write The Edge Becomes The Center? My last book involved a cross-country trip over several months to interview hundreds of unemployed Americans. When I visited DeWitt, Nebraska —population 572 — I was introduced to a small town that was originally built around a factory where Vice Grip locking pliers were manufactured. Eventually the family that owned that factor sold it to American Tool and American Tool was acquired by Rubbermaid and the factory was moved to China. When that factory emptied out in DeWitt, it gutted the town. A lot of people who lived there had to leave and the town couldn’t support a grocery store. This got me thinking about the building blocks for a strong community —what are the things that make a neighborhood or community economically, culturally, and environmentally healthy? From there I started thinking about all of the neighborhoods in New York City that I have lived in over the past 20 years and I started thinking about what makes these neighborhoods healthy and thriving. And from there, this book was born. I’ve been reading a lot of nonfiction with strong associations to place — so I was engrossed in Joan Didion’s Where I Was From (her family history in California) and Francisco Goldman’s The Interior Circuit, which is a remarkable book that is part personal history, part Mexico City biography. Jazz by Toni Morrison was the first book that really gripped me. Other candidates include: Pedro Paramo by Juan Rulfo, Waiting for Snow in Havana by Carlos Eire, Ask the Dust by John Fante, Go Tell It On the Mountain by James Baldwin, and just about anything that Joan Didion writes, particularly her nonfiction. She is my zenith. I think in all cases I’m drawn to a strong voice, both in fiction and nonfiction, and very concise writing. I like bare bones stuff and the writers who are able to do that with a strong voice are always among my favorites. I’ve been very excited about James Hannaham’s Delicious Foods, which is just coming out this month. I’m also eagerly awaiting Suketu Mehta’s forthcoming nonfiction book about New York City. I can hardly wrap my head around this question! I have an idea bouncing around but it is rather raw and unformed at this point so I should probably do a bit more work before sharing it. But it’s exciting to think about — especially since it involves Hawaii.